Bursting out of the underground of Bulgaria, Gallya has rapidly become a name on the lips of techno connoisseurs across the globe. 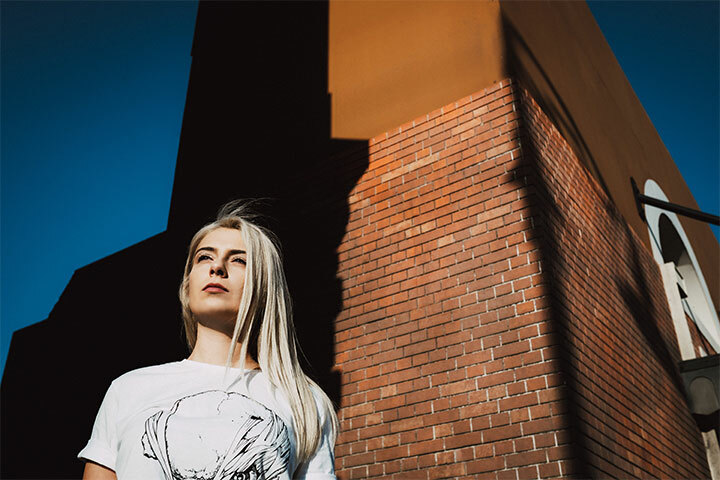 In a short time, the young talent has not only had releases on the likes of Say What?, mau5trap, Octopus Recordings and more, but she’s also broken the Beatport Techno Top 100 and founded her own label, Set About. The label alone—run along with cofounder Metodi Hristov—is a serious endeavor, releasing the likes of Teenage Mutants, Maksim Dark, and GusGus, to name a few. Add to that a full-time gig schedule, and even a dip into the waters of curating music and scoring for film, and you’ve got an artist who seems to have boundless energy and talent. Speeding along after her collaboration with Hristov on her White Lines EP, as well as yet another EP for Form Music, Gallya dropped a collaborative track with Monstergetdown last week. Titled “Processed,” it’s another deep and spacey techno thumper. Originally planned for mau5trap, the single ended up fitting much better with some very heavy-hitters on an upcoming Set About compilation. With an already impressive reputation and a constant strive to push into new endeavors, there’s no telling what Gallya will be up to next. She was kind enough to set aside some time with us to chat about a few of the projects she is juggling at the moment, as well as put together a 30-minute mix that will give you a sense of the type of techno Gallya is all about. You seem to always be on the go. You just finished up a show in Beirut and then one in Montevideo. How did those go? Yes, I just played b2b with Metodi Hristov in Beirut for a second time—it’s always awesome. When I first got there, I didn’t know what to expect, but it was super surprising to see how many people are listening to this style of music. The next day, I had to take off to Uruguay for my gig in Montevideo. The party was awesome; the venue was a ballroom. It was super so many people came to listen my set, and I really enjoyed playing there. It’s always a pleasure to go to Uruguay and spend some free time there. I ended up spending five days there, and it was really enjoyable. You’ve wrapped several releases in a handful of months. What’s your production process like to keep that kind of output? How did your collaboration with Monstergetdown come about, and what was the process like, compared to the other collaborations you’ve done? Yes! He is an artist from mau5trap, where I’ve also released some music. One day, they just tweeted about how great it would be if we did a collab, asking what people thought. When I saw it, I thought, “Why not?” I sent him a message, and he was also interested and sent over an idea for the track. Two weeks later, we were ready! Usually when I do collaborations, there is an endless waiting for stamps. I love to work fast, and I am very happy when things happen quickly. We worked really effectively together, and I think the track shows that perfectly. That’s why I proposed we release it on my label, Set About—because I wanted it to come out quickly, and that gave me control to do that. Everyone agreed, which is great, because the track is different; it is a perfect fit for our compilation. Big thanks to mau5trap for the great idea for this collaboration and supporting us to release it on Set About. Speaking of the compilation, what was the idea behind this album, and who are some of the artists you’re excited to have on it? We do this type of compilation a couple times a year. It gives Metodi Hristov and me a chance to express our vision about music through tracks from many different producers in one release. We always have a range of artists and are very proud of our selections. We have tracks from artists who have released on the label, like Teenage Mutants, whose music is always awesome and very successful. We also have a bunch of great new artists. For example, we’re really happy we have SUDO on our label! Their track is called “Booster,” and it’s the first track on the compilation—I love the sounds they use. We plan to continue with compilations much more often in the future, because they’re different than single releases and much more interesting for us and for the fans. Set About has had a fair amount of success so far, but you don’t have a staff for it, correct? How do you handle all of the tasks between you, Hristov, and label manager Marin? That’s right. We all travel a lot, so we’re communicating 24/7 to make sure we’re on top of it if someone misses something. We rely on each other to keep each other accountable, and it always ends up working. It gets tough with all these tours, and we may end up hiring someone in the future as we all continue to get busier, but the running of our label alone is really important to me, because it means we have a constant eye on how things are working in the music industry. It’s our baby elephant, and it’s a pleasure to see how it’s grown and will continue to grow over the years. You’ve previously said you wanted Set About to showcase both big talents and unknown producers. What do you usually look for in an artist when considering whom to put out? The only thing we are looking for is the music. If we like the track, we will release it no matter how many followers you have on Beatport or social media. I remember how hard it was in the beginning, when no one wanted to release my music; many labels rejected me before I was able to release on mau5trap and FORM. Thankfully, they believed in me without thinking about my followers. Since we started the label, I have a place to express myself without waiting for someone famous to approve my music and am able to have full control of the promotion. Set About is the place where everyone knows me from, and I couldn’t be more proud of that. That’s why we want to give everyone a chance. The biggest future stars could be out there, sending demos that no one is answering because of politics and social media numbers. We just want to support the good ones. mau5trap is also a good example of a label releasing many different styles and artists, from very famous to unknown ones. I love them. Any updates on that label showcase in December? Still too early to share anything, but we will soon! What are you working on next, release-wise, and what new areas are you excited to explore in the studio? I am working on some new tracks that will be released next year. Also, I’ve developed a new love for movie scores. Unfortunately, it’s not as easy as techno, haha, but this is definitely where I want my next step to be with music. What sounds and artists are exciting you the most in the techno world, and where would you like to see the genre go in the future? I love the dark, mysterious sound, with techno drums and rough basslines. Sometimes, I miss old-school progressive techno, haha. But lately, I’ve been loving the production of Steam Shape, Metodi Hristov, Popof, Teenage Mutants, and Drunken Kong. I think the techno audience is growing quickly with a lot of DJs shifting into techno, so it’s getting very interesting. I’m excited to see how genres are moving and changing. You never know what to expect.